Nigerians should brace for adverse weather conditions such as heavy rainfall and flooding, and diseases like cholera this year. 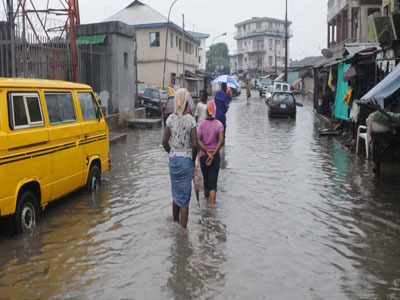 This is against the backdrop of predictions by the World Health Organisation (WHO) that rainfall patterns will be unusually heavy and lead to serious flooding and major outbreaks of malaria, cholera and Rift Valley Fever. According to WHO, El Niño which is a warming of the central to eastern tropical Pacific Ocean, affects rainfall patterns and temperatures most intensely in the tropical regions of Africa, Asia-Pacific, and Latin America, which are particularly vulnerable to natural hazards. Typically, some places receive much more rain than normal while others receive much less. According to a new report by WHO, severe drought, flooding, heavy rains and temperature rises are all known effects of El Niño that can lead to food insecurity and malnutrition, disease outbreaks, acute water shortages, and disruption of health services. The health implications are usually more intense in developing countries with fewer capacities to reduce the health consequences. Also, a new study published in The Lancet, has concluded that the Zika outbreak sweeping through the Americas was triggered by the El Niño phenomenon and global warming. Meanwhile, experts are recommending that aircraft flying into Nigeria from countries hit by the Zika virus should be sprayed with insecticides to stop the virus from spreading. To combat mosquitos that might have entered aircraft travelling to Nigeria, insecticides should be sprayed to kill them off. Similarly, the DailyMailUK reported yesterday that planes arriving in the United Kingdom (UK) from all countries where cases of Zika have been confirmed in South America and the Caribbean will be sprayed as a precautionary measure. But The Guardian reliably learnt that the precautions – known as ‘disinfection’ – already occur on many flights from the region as a precaution against mosquito-borne malaria. The WHO advises it has found no evidence that insecticide sprays used in planes are harmful to human health when used as recommended. Individuals can protect themselves from mosquito bites by using insect repellents, and wearing long sleeves and long pants – especially during daylight, when the mosquitoes tend to be most active, health officials say.